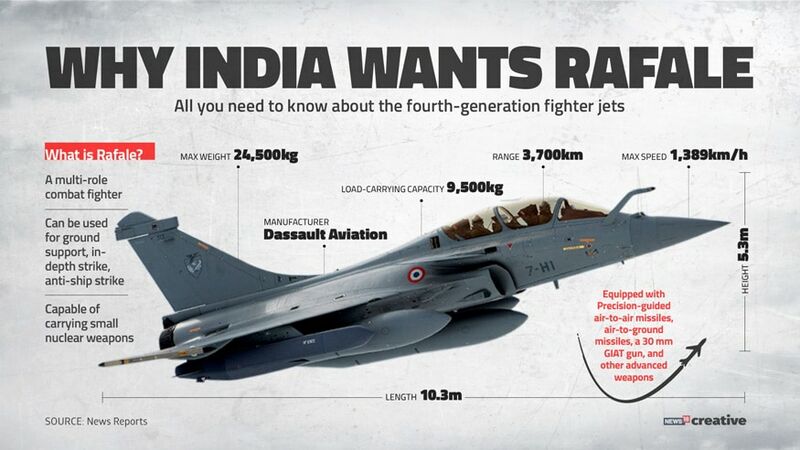 Here’s a look at the history and specifications of the Dassault Rafale to understand what makes this Fighter Jet so special for the Indian Air Force? Rafale is a French word meaning "gust of wind" and is a French-origin Delta winged, twin engine multi-role fighter aircraft manufactured and designed by Dassault Aviation. The initial requirement of Rafale came into light in mid-1970s, when both the French Air Force and Navy expressed a requirement for a new generation of fighters. In early 80’s Dassault was formally announced to build aircraft for the French government and the testing started in 1991. The production of the first aircraft series started in late 1992, but was suspended in 1995 due to political and economic uncertainty. The production was restarted in 1997 after an initial order of 48 aircraft was placed by the Ministry of Defence followed by a further order of 59 Rafale in 2004 and 60 aircraft in 2009. The French Air Force first operational Rafale squadron, EC 1/7 “Provence”, was stationed at Saint-Dizier air base in 2006. Along with French Military including Air Force and Navy, countries like Egypt and Qatar are the current operators of the Rafale MMRCA, while India will join the list this year itself. Though the idea to induct additional fighter jets in the IAF has been since 2001, the actual process began in 2007. The current IAF fleet largely consists of heavy and light-weight combat aircraft. So the defence ministry considered bringing in intermediate medium-weight fighter jets. The Defence Acquisition Council, headed by then Defence Minister AK Antony, approved the ‘Request For Proposal’ to buy 126 aircraft in August 2007. This kick-started the bidding process. The plan included acquiring 126 aircraft, 18 of them in fly-away condition and the rest to be made in India at the Hindustan Aeronautics facility under transfer of technology.